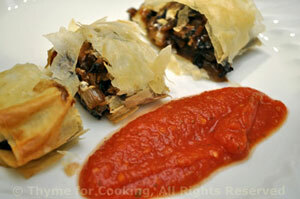 Mushroom Strudel with Tomato Sauce, Thyme for Cooking gourmet starters. Strudel is easy to make and fun to serve. Filo (phyllo) is in either the dairy or freezer section of the supermarket. If the filo is frozen remember to thaw earlier. Use a soft brush if possible. Sauté mushrooms, shallots, and garlic until well-browned. Add Worcestershire sauce, red wine and simmer until reduced almost completely. Add mustard, yogurt and stir well. Mixture should be moist but no excess liquid. Remove 1 sheet of pastry and cover the rest. Lay the sheet out flat and brush all over with olive oil, starting with the edges (they dry out fastest) and working in. Sprinkle Parmesan evenly, then lay the second sheet on top. Brush with olive oil. Spoon the mushrooms about 2" (5cm) from the narrower edge. Roll the end over the top and continue rolling it up, like a jelly roll. Carefully lift or roll onto a lightly oiled baking sheet. Brush the top with olive oil and bake at 400F (200C) for 12 - 15 minutes, until the pastry is golden brown. When done, remove to a cutting board. Cut in large slices and serve, with Tomato Sauce. Sauté garlic in olive oil until tender. Add remaining ingredients and heat through.